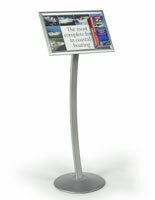 Our display sign stand features sleek European Styling. 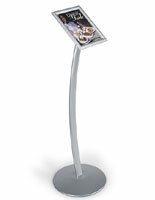 Display your graphic, sign or poster in this satin aluminum point of purchase display. Quick graphics changes are easy! 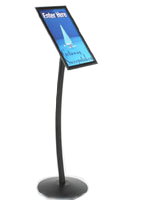 Designed with ease of use in mind, our display sign stand makes graphics changes a snap. 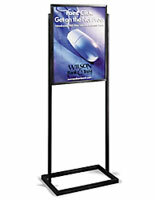 Simply lift the sides, top and bottom of the frame, insert your graphic, sign, or poster under the protective non-glare cover and "snap" close. 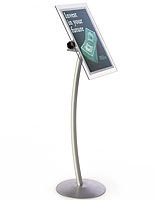 This display sign stand, also called a point of purchase sign holder includes all hardware needed to for assembly. 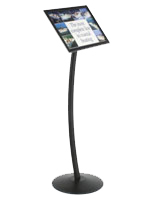 Display sign stand is designed to hold one 11"w x 17"h sign, poster or custom printed graphic. Trying this one over the magnetic overlay versions that tend to wear down rather quickly. Hopeful this will be a better solution in the long run! 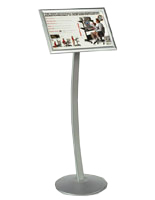 We ordered 2 poster stands for our center at Dartmouth College. I love the design! I ordered and received my stands within a few days. Easy assembly and high quality product. I would definitely order from Display2Go again. 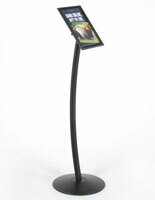 These spec stands are great - fairly easy to put together. They only last for about a year durability wise which is not ideal for how expensive they are. They look clean and modern which is why we decided to purchase. Hi Lauren, We are sorry to hear that your signs only lasted a year. If you have any issues with your new ones please reach out to the customer care center. This stand holder is cheap and the assembly is a pain. The hardware has to go into the slots at such an angle that it's almost impossible to screw the pieces in properly without stripping either the heads or the threading on the screws. This seems to be customary with all the products I have ordered from this site so I felt compelled to review it. Hi Charles, We are sorry to hear about the menu stand. 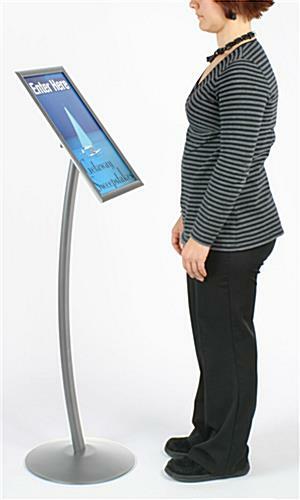 We will have a customer care representative reach out to you.